This quick-to-make Turkey Tom Yum Soup with Mushrooms is the perfect dish for leftover Thanksgiving turkey (or when you have extra rotisserie chicken on hand). Meaning hot and sour, this tom yum soup is definitely that, as well as spicy, bright, clean, and fresh. And red curry paste adds extra flavor in this Thai soup. Red curry paste is popular in Thai cooking and can be found in most supermarkets and specialty grocery stores. Made of dried red chiles, herbs, and spices, it packs a punch, so go easy if you’re sensitive. Heat broth, curry paste, fish sauce, ginger, and garlic in a pot over medium-high to boiling. Add mushrooms; reduce heat to medium and simmer 2–3 minutes. Add tomatoes, green beans, and scallions; simmer 4–5 minutes. 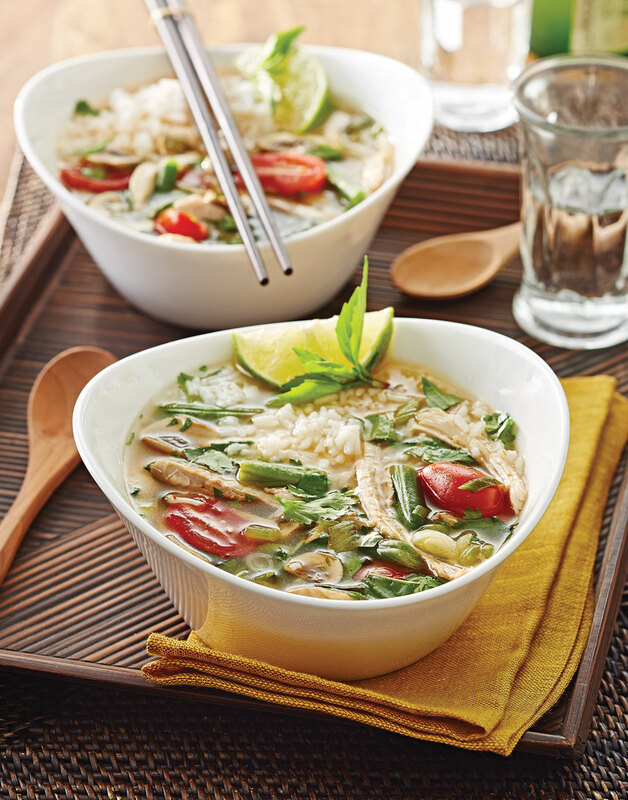 Stir in turkey, basil, cilantro, zest, and lime juice; serve soup with rice. Fish sauce adds flavor and saltiness. Add 1 tablespoon, adjusting with more once the soup has cooked. Lime juice is a big player in this hot and sour soup. For the best flavor, be sure to use fresh lime juice.